Highly Configurable: 23 stand variations allow customization of the Axio Scope.A1. Choose from 5 upper bodies, 3 lower bodies and 2 vario columns. Range of Applications: from anatomical study to intravital microscopy; transmitted light applications to multiple fluorescence labeling, from the thinnest tissue sections to a sample height of 380mm. 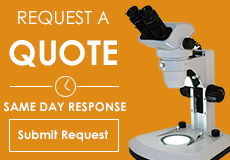 High-resolution DIC and PlasDIC; the inexpensive relief contrast for unstained specimens. An integrated LED feature guarantees stable and color-neutral transmitted light. This further enables consistent color temperature, which is ideal for digital images. LED, HBO or XBO illumination available for fluorescence illumination. The sample space of the Axio Scope.A1 is scalable for specimen thickness of 0-110mm. Ergonomic stage drive can be moved along a 90mm Y-axis to be positioned where it is most comfortable. FLUAR objectives. The photon collector objectives with high numerical apertures, good contrast, and outstanding transmission. Ideal for rendering the weakest fluorescence available. Plan-APOCHROMAT objectives. The high performance objectives with the best color correction and highest numerical aperture for brilliant images in all techniques. Outstanding point spread function and spherical correction. Flexibility: Whether analyzing unstained cells using intravital microscopy or observing histologically stained sections and bone sections, transmitted light techniques are the standard for cytology testing in routine laboratories. 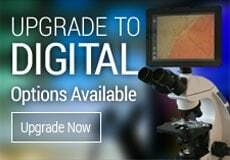 Axio Scope.A1 microscopes enable you to master brightfield, darkfield, phase contrast, differential interference contrast (DIC) and Carl Zeiss' economical alternative, PlasDIC. The transmitted light beam path of the Axio Scope.A1 provides sharp image contrast and standardized, comprehensive illumination for tasks connected with routine examination. Axio Scope.A1 is perfectly equipped for cytology testing with fluorescence. 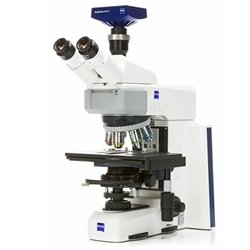 This microscope provides excellent contrast and minimizes any scattered light; an advantage especially for low-light and low-contrast samples. Use LEDs or any standard light source for optimum fluorescence.